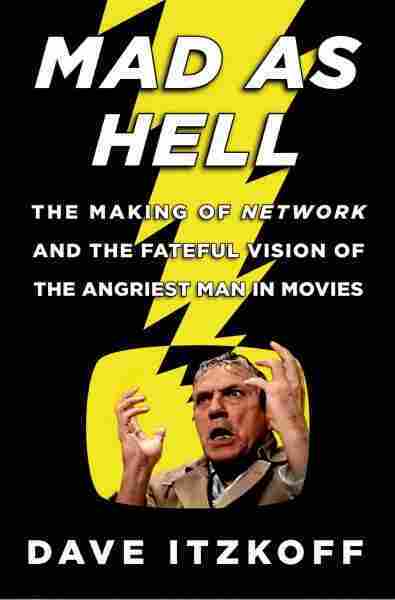 Book Review: 'Mad As Hell,' By Dave Itzkoff Dave Itzkoff's new book, Mad as Hell, chronicles the making of the movie Network. NPR commentator Ted Koppel says Network was meant as a satire, but seems like "inspired prophecy" now. It may have been "mad" as in angry or "mad" as in deranged. Either way, almost 40 years ago, screenwriter Paddy Chayefsky anticipated the future of television news. He envisioned a nasty, profit-oriented industry that would literally kill for ratings. (Network was — after all — satire, not a documentary.) Dave Itzkoff's account of how the brilliant, stubborn and pugnacious Chafesky did his research, wrote his script and, ultimately, imposed his vision on the film is elegantly executed. Still, I came away knowing much more about how the film was made than why. Itzkoff writes that among those whom Chayefsky interviewed for his screenplay were Walter Cronkite and John Chancellor. Other giants of network news sitting at the anchor desk at that time were David Brinkley and Howard K. Smith. Peter Jennings and I were thirty-somethings back then; part of a massive news-gathering team that, literally, covered the world. Just how, back then, when news departments were at the top of their game, did Chayefsky know that the corporate bean counters would shut down the foreign bureaus, eliminate serious documentaries, and turn news networks into branches of their entertainment divisions? Remember, all of this was before CNN and Fox News, before MSNBC, before endless blather and the expression of partisan opinion were considered legitimate substitutes for journalism. Back in 1976 the movie Network seemed like savage satire. Today it seems more like inspired prophesy. Itzkoff tries to square the circle in a final chapter in which he notes without comment or irony that Glenn Beck claims to have been influenced by Howard Beale, the mad anchor. With what seems to me excessive tolerance, Itzkoff also permits Bill O'Reilly to pass himself off as a successor to Eric Sevareid and David Brinkley. That, to borrow from Cronkite, is not the way it was. Dave Itzkoff is right to give Paddy Chayefsky his due as a cultural icon. After all, he knew what a flash mob was before the Internet made it a reality; and he knew what could drive angry Americans to yell into the night. Go ahead, roll down your car windows and try it. (I know. You're NPR listeners, so you don't feel comfortable yelling. Just whisper.) "I'm mad as hell, and I'm not going to take this anymore!" It still feels good, doesn't it?